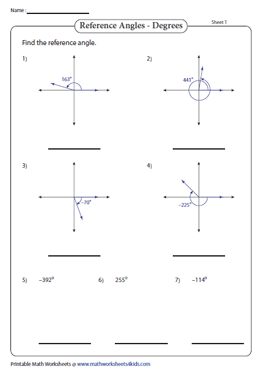 This set of high school worksheets offers topics like finding the reference angles in degrees and radians; finding the coterminal angles for the indicated angles, positive and negative coterminal angles, and more. 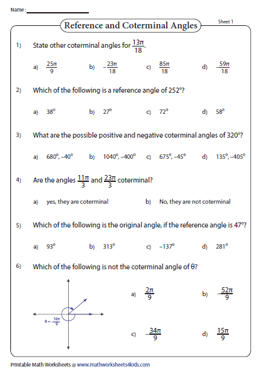 Reinforce the concept of reference and coterminal angles with the multiple response worksheets featured here. Read the coordinate plane and find the reference angle for each indicated angle. The angles are expressed in degrees. Problems without coordinate plane are also included. 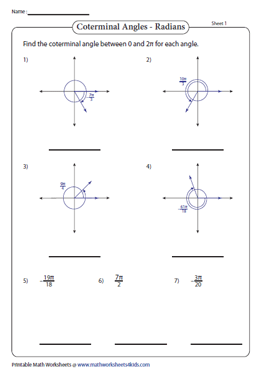 Each worksheet encompasses seven unique problems with the angles presented in radians. Determine the reference angle for each problem. 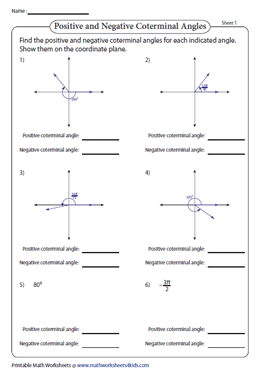 Identify the coterminal angle between 0° and 360° for each given angle. Ex: Find the coterminal angle for 597°. 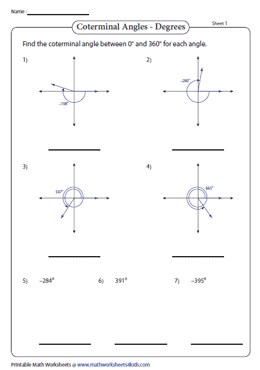 Each worksheet contains six problems to find coterminal angles between 0 and 2 pi for the given angle (in radians). The angles are presented in degrees or radians. Add 360o or 2 pi to find the positive coterminal angle. Subtract 360o or 2 pi to find the negative coterminal angle. Show your result on the coordinate plane. 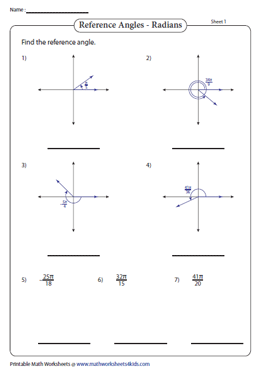 The worksheets comprise six unique questions covering the diverse aspects of reference angles and coterminal angles. Verify your responses with the answer key.